ALTHOUGH WE NEVER FORGET OUR HERITAGE, CANNONDALE AND OUR DEALERS HAVE COME A LONG WAY SINCE OUR BIRTH IN A CROWDED LOFT ABOVE A PICKLE FACTORY IN 1971. 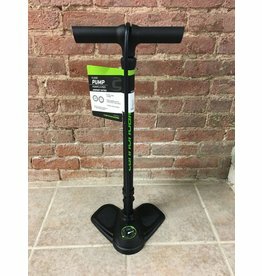 Many of the ideas that keep Cannondale products on the cutting edge come from the sponsored athletes on the company's professional racing teams. The feedback provided by the company's riders, combined with Cannondale's best-in-class production processes, fuel a near constant stream of both new innovations and improvements to existing products. With a laser focus on a rider-first mentality, we push our employees, our dealers and the bike industry. These refinements aren't limited to the company's competitive road racing and mountain bikes, however; the insights gained through racing, coupled with Cannondale's quest for constant improvement, have also benefited the company's wide array of lightweight recreational bikes as well as its lines of state-of-the-art cycling apparel and parts & accessories. THIS IS SUMMED UP IN OUR MANTRA TO: NEVER SETTLE IN OUR QUEST TO CREATE THE PERFECT RIDE. 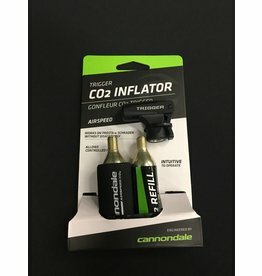 Fastest way to finish fixing a flat tire is with Cannondale's Trigger Co2 inflator. Great fro raceday or any time you want to get up to pressure quickly. 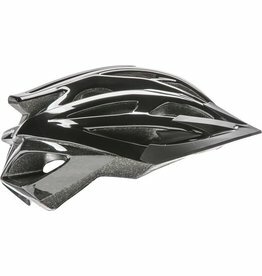 Includes thumb lock inflation head, (2) 16g Co2 cartridges, a foam insulator to protect your hand.